Big, beautiful, and the longest undammed, free-flowing river in the lower 48 states, the Yellowstone River flows along the scenic mountain stretch of the north boundary of Yellowstone National Park. View bald eagles and osprey, or perhaps catch a glimpse of deer, elk or antelope as they drink from this wild river. 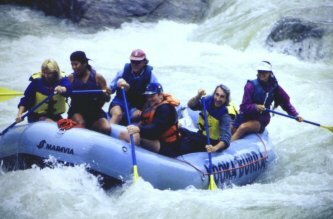 The Yellowstone River offers exciting class II or III rapids to wet your appetite for fun and adventure. Half-day trips are available with professional guides. One trip included in the Basic Package Price.